If you are shown the offer, click on the green button to receive it for free. Once you receive it, you can find it in Badges -> My Collection in your latest Mix-n-Match album, or on the Dominoes page under the Challenges tab. Win 4 games with at least 10 points more than your opponent in 2 weeks! At this point, it’s still unknown what requirements Pogo is using to determine “Superstar Members”. Unfortunately, if your account isn’t eligible by whatever standard Pogo has chosen for these types of promotions, you won’t even see the early-access offer (well, except you get to see it here). Did you get this offer? Let us know in a comment below. Yes I did receive it and finally in a game I like……..lol With more Easter Egg badges on Monday I think I will just wait to use it when everything else is completed. I lied…..lol I didn’t wait. It was an easy badge and didn’t take long to do it. It was waiting for me this morning! I received the badge also, thank you. I received the badge and was delighted, have been working on ranking out in this game. Thank you Pogo! I received it and played it immediately. Got the badge in four games. Now that was a pleasant surprise. I received the badge also ,but can not find it to play. Same here, I can’t find it either. Thanks Dusty I found it. Nice surprise this AM. Thanks Pogo. Did you click on the “0 gems” when the offer popped up? If not, it should ask you again in about 24 hours. Actually I think pogo should get rid of the facebook connect library. It is just another way for facebook to data-mine information from pogo players. And I think this facebook stuff just creates a backdoor for other facebook shenanigans. i got mine this morning. thank you pogo. one of my favorite games. I got it but I didn’t accept it; I despise dominoes and won’t play it except for a weekly badge. I won’t accept it tomorrow either. YUK! Did you click on “0 gems”? If not, you should get the offer again in about 24 hours. You must click on the button or you will never get it. If you do it correctly you will get another pop up that says “take me to badges or take me to minis”. That’s not the exact wording, but it’s close. 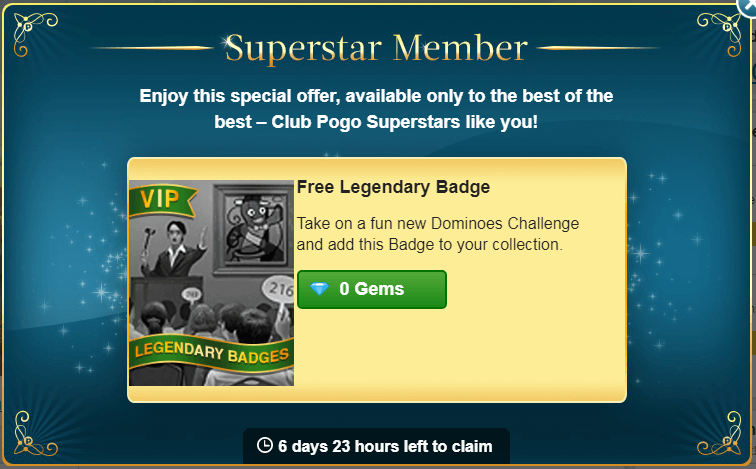 Pogo uses the same pop up for a free badge as they did when they gave out free superstar mini items. Yes, I have received a number of VIP free challenges; dominoes being the latest. I wonder if they base who is eligible for VIP badges based on amount of money spent on gems. 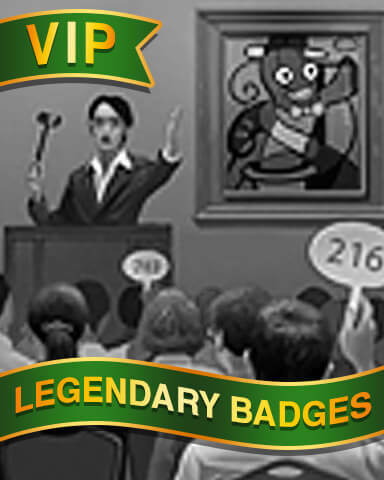 I don’t buy gems, yet I have received the VIP badges every time they award them. Perhaps it is a Pogo secret formula. Carolyn, I doubt that. I have multiple accounts but only one buys gems but all of them got the VIP badge this morning. The other accounts are there just to multi-browse. I, too, got the badge and for once, it was a PLEASANT surprise(LOL)………getting a badge that is not connected to a marathon(LOL)!!! I received it for both of my accounts. I have always enjoyed Dominoes. Superstar! Glad to see this, as this on the 14th of the month usually means the Legendary Badges will be coming on the 15th. We’ll all be busy with Egg Hunt and the other badges we have deadlines on, but I always find a few of these in games I enjoy. I’ll buy them and save them for later. Well, I’m surprised. Hubby nor I didn’t get the Superstar badge. That’s a first in a very long time. However, Pogo has been very generous with badges of late, so there are no complaints here. Nice surprise this morning receiving this badge. Was out all day, came home and took care of my responsibilities and then I won the badge in about 15 minutes. These badges are really adding up, yay! i did not receive rhe badge. and i did npt receive the rokres as promised. I got it! I always accept any free badges. They also show up in your game challenges once you have accepted. This one is in my Mix-n-Match. It’s called Do I Hear.